We were admiring the natural beauty of the countryside as we hiked through the mountains. We were so engrossed in the solitude we weren’t prepared for what happened next. On the ridge, a large baboon stood watching us from about 150 yards away. Once he was satisfied that we weren’t a threat, he started down the path, followed by several hundred other baboons ranging from adults to babies. I must admit that at first I was apprehensive about being surrounded by such creatures in the wild. I mean, no cages, no trainers, no help—just us and the baboon herd. The babies scurried along with their moms as the males stood guard and kept us in view. Some of the little one even climbed onto their mother’s backs, just to be safe. I think they were more interested in us than anything else, but watching them was an amazing exercise in self-control. We were in their territory, marching through their backyard, and they were clearly in charge. The self-control was to keep us from running away. 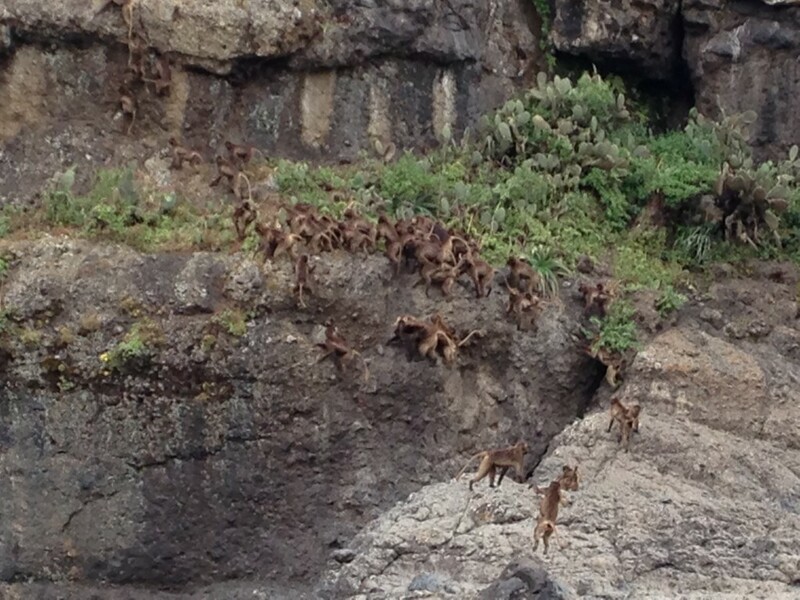 But they stood against the cliffs and watched us as we took pictures and wandered as close as we dared. It was a reminder of the creation of God, and a wonderful picture of family. Previous: DOES YOUR SIMPLE LIFE IMPACT THEM? Next: WHAT DOES A FAIRYTALE MARRIAGE LOOK LIKE?